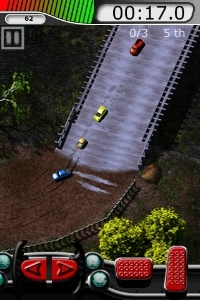 If you are passionate about car racing, then the new game released by Dracoders is what you need! Racing Mania is new but already revving up to be a strong contender for first place in its category. Challengeing game offers: Background music professionally composed by Simone Cicconi for extra adrenaline; Three levels of difficulty; A shop where you can pick up necessary supplies and done some repair to your racing car; Bluetooth technology-you can grab three other people and enjoy a multiplayer competition. You can choose from ten different cars designed from 3D models for more realistic feel. With Racing Mania you can explore what real race driver experiences! This app lets you climb behind the wheel and try to sport yourself. 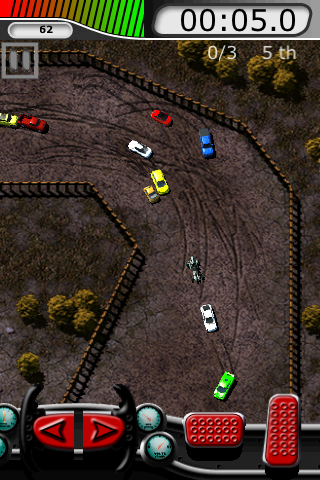 Besides vehicle selection the app enables you to decide which of fifteen tracks you want to struggle. There are five and each in three categories - dig-up, city and futuristic. Each track is accompanied by music to pump up the adrenalin. In addition, you can take practise and learn to control the cars properly and make it around the curves to improve your technique and style. At the end of each race you can pick up more speed, acceleration and repairs at the shop to keep your vehicle in top condition. Bluetooth capability gives you opportunity to engage in multiplayer races that adds extra fun and challenge to the already frenetic competition. Racing Mania 1.0 is only $1.99 and available worldwide exclusively through the App Store in the Games category.